Online visitor registration for ITMA 2019, the world’s largest textile and garment manufacturing technology showcase, opens today. Held every four years, the exhibition will be staged at Fira de Barcelona, Gran Via venue, Spain, from 20-26 June 2019. 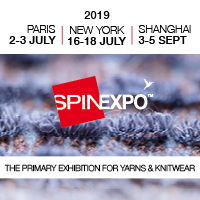 Visitors can enjoy early bird rates until 15 May 2019 when they buy badges online, according to CEMATEX, the European Committee of Textile Machinery Manufacturers, which owns ITMA. “ITMA 2019 exhibition space has been sold out since April, and many of our exhibitors will be using the platform to launch new machinery and innovative solutions. We expect interest from visitors to be very strong. Hence, visitors are advised to book their accommodation and buy their badge early,” commented Fritz P. Mayer, President of CEMATEX. Visitors buying their badge can also book seats at the conferences and forums, which are taking place during the show. To avoid onsite queues, once they have purchased their badges they can print them before they arrive at the exhibition. In addition, visitors requiring a visa to enter Spain can request an invitation letter when ordering their badge. ITMA 2019 supporting organisation members can enjoy special group rates in appreciation for their support, and so far, more than 100 trade and professional associations have pledged support. Coinciding with the online registration is the launch of the official app for ITMA 2019. The app can be downloaded free of charge from the Apple App Store and Google Play. In addition to providing key information on the exhibition, the app helps visitors to plan their visit. Visitors can search more than 1,660 exhibitors by exhibit chapter and country and shortlist the booths they would like to visit. Nearer the date of the exhibition, they will be able to locate them on the floorplan and plan their route. “As ITMA is a huge exhibition, the app will be a useful tool to help exhibitors and visitors maximise their time and resources on site. An appointment scheduler will allow visitors to request meetings with exhibitors before they arrive at the show. The scheduler and online floorplan will be available from late April 2019,” said Sylvia Phua, Managing Director of ITMA Services which organises ITMA 2019.